1686 Dapper View of St. WE SELL ONLY ORIGINAL ANTIQUE MAPS - NOT REPRODUCTIONS JOIN OUR WEEKLY MAILING LIST FOR NEWEST STOCK. 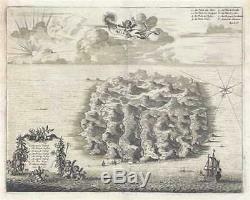 Description: This is a 1686 Olfert Dapper view of St. The view depicts the entirety of the island, illustrating its topography and rivers. Eight locations are numerically identified, with an index in Dutch in the lower left corner, and a French index in the upper right. Six of the eight identified locations correspond to valleys most likely associated with the rivers. The Dutch index on the lower left is surrounded by a decorative cartouche. Several ships are illustrated in the Atlantic on their way to and from the island. Helena is an island 2,500 miles east of Rio de Janeiro and 1,210 miles west of the Cunene River, which establishes the border between Namibia and Angola. The island is approximately 10 miles by 5 miles. Helena holds the distinction of being one the most remote islands in the world, and was uninhabited when discovered by the Portuguese in 1502. It became an important waypoint for vessels traveling to Europe from Asia and South America and is also famous as a place of exile. Napoleon was exiled there by the British in 1815, and the island served as a prison camp during the Second Boer War. Helena also hosted a series of experiments in conservation, reforestation, and the creation of artificial rainfall between 1791 and 1833. These experiments helped establish the beginnings of modern environmentalism. This view was produced by Olfert Dapper and published by in the French edition of Description of Africa entitled Description de L'Afrique and published in 1686. Size: Printed area measures 10 inches high by 12.75 inches wide. Verso reinforcement along left and right margins. Verso repair of small centerfold separation. If your address is a P. DHL International EXPRESS (45 USD). We can use your Federal Express Account. Duty varies by country and we cannot predict the amount you will be charged. Some countries are duty free, others are not. Additional Services Conservation Framing Services: Geographicus recommends basic conservation framing services for any antique paper. We do not offer this service. Antique Map Restoration Services: Geographicus can repair and restore your antique map. Services include deacidification cleaning flattening and backing. The item "1686 Dapper View of St. Helena Island" is in sale since Monday, June 18, 2018. This item is in the category "Antiques\Maps, Atlases & Globes\Africa Maps". The seller is "geographicusmaps" and is located in 11221. This item can be shipped worldwide.